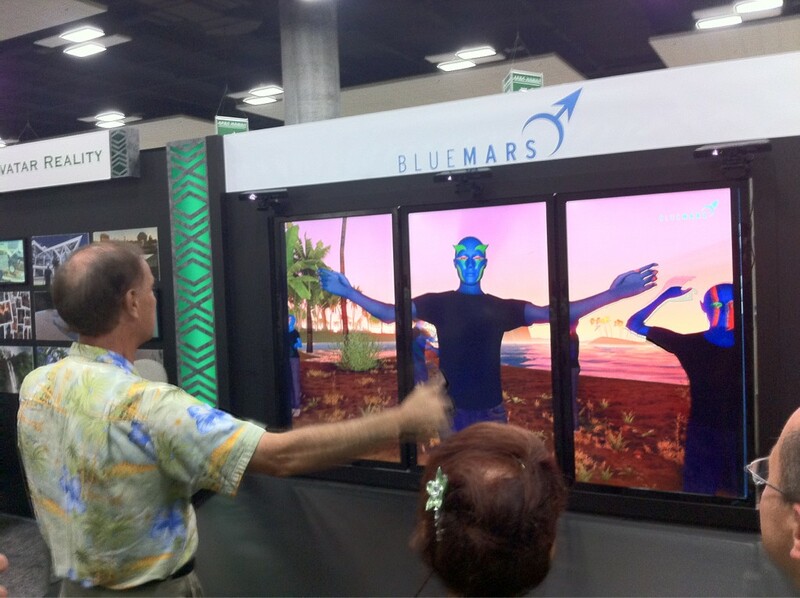 Blue Mars+Xbox Kinect on Display at APEC! We're posting from the Hawaii Convention Center, where we are showing a demo of Blue Mars to thousands of international delegates attending the APEC (Asia-Pacific Economic Cooperation) 2011 conference! We're part of an exhibition presented by SEE-IT, a non-profit organization (founded by our CEO Henk Rogers) whose mission is to showcase and promote innovative technologies developed here in Hawaii, and encourage more science, technology, engineering and mathematics (STEM) education in Hawaii's schools. In addition to our Blue Mars, Blue Mars Lite and Blue Mars Mobile applications, we're featuring a custom-made interactive display just for APEC, using Xbox Kinect motion sensors and a giant LED screen to enable visitors to interact with our avatars using movement. We also released a new city in Blue Mars that will let you get a virtual taste of our exhibit, so be sure to check it out!